According to the OECD only 2% of employees regularly work very long hours, which isn't much when you compare it with the OECD average of 13%. Instead, they spend around two-thirds of their day (16 hours) eating, sleeping and indulging in leisurely pursuits. "Something is rotten in the state of Denmark," goes the line in Shakespeare's Hamlet. But four centuries after the play was written, the analysis couldn't be less accurate. According to the OECD Better Life report, Danes have a better work-life balance than any other country surveyed. Only 2% of employees regularly work very long hours, which isn't much when you compare it with the OECD average of 13%. Instead, they spend around two-thirds of their day (16 hours) eating, sleeping and indulging in leisurely pursuits. It's not just the workers: Danes rank above average in an intimidatingly long list of areas: environmental quality, civic engagement, education, skills, jobs, earnings, well-being, personal security and social connections. That last area, social support networks, is key: 96% of people report having friends or relatives they can count on in times of trouble, compared with the 88% across other OECD countries. Air quality in Denmark is also better than the OECD average (in scientific terms that translates as 11.1 micrograms of PM2.5 pollution per cubic metre, as opposed to 14.05 elsewhere). Danes are unusually engaged in the political process – voter turnout stands at 86% and is among the highest in the OECD. They’re also well educated: 80% of adults aged 25-64 have completed upper-secondary education. That's four percentage points higher than the OECD average. According to the Danes themselves, the key is to prioritize life over work. And when they are at work, they enjoy a high degree of flexibility. They can often choose when they start their working day and have the option of working from home. The lunch break is often at a designated time each day, enabling colleagues to interact and eat together, thus enabling them to leave their desks. There is a minimum five weeks’ paid holiday for all earners. However, working fewer hours doesn’t mean they do less. Researchers at the OECD found that overly long working days actually reduce productivity. Danish lifestyle choices are reflected in their attitudes, as recorded by the survey. When you look at what is important to Danish citizens, jobs and income are much lower down the list than health, education, the environment and work-life balance. “Money is not as important in the social life here as, for example, Britain and America. We probably spend our money differently. We don’t buy big houses or big cars, we like to spend our money on socializing with others,” says Professor of Economics Christian Bjørnskov from Aarhus Business School. There's one significant trade-off: Danes pay high taxes. But according to a recent Bloomberg report, they don’t mind. That’s because those taxes go towards paying for the country’s welfare state, which they treasure. It’s no surprise then, that the Danes report the highest levels of life satisfaction of all surveyed countries. Denmark was also ranked first in the World Happiness Report 2013, third in the World Happiness Report 2015, and first again in the World Happiness Report 2016 Update. The US vs Denmark: Is the Scandinavian model best for social mobility? Is there anything Denmark doesn’t do well? Well, perhaps unsurprisingly, no country is in entirely perfect health. 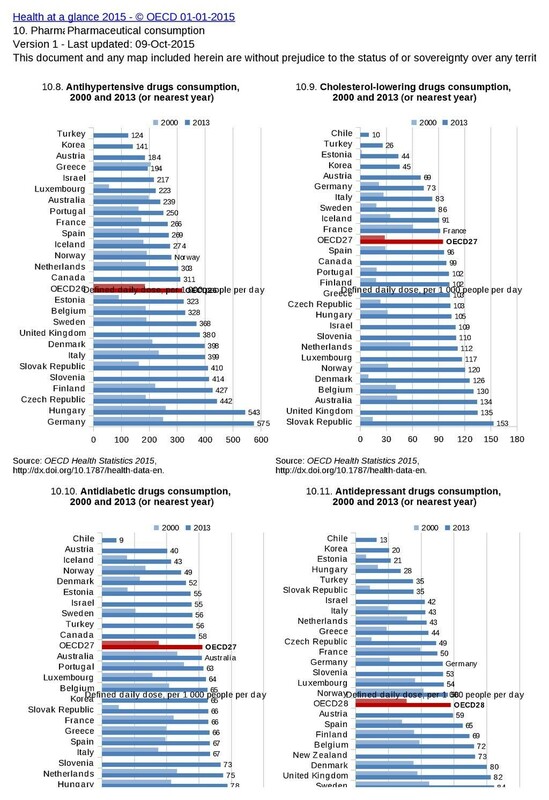 Apart from anti-diabetic medication, Danes consume more pharmaceuticals than the OECD average, including antidepressants. The OECD says that Denmark could be doing more to help its low-skilled and low-wage workers. The gap between rich and poor is high – the top 20% of the population earns nearly four times as much as the bottom 20%. Denmark needs to lure more skilled workers to its shores if it’s to prop up its economic growth, particularly in the areas of engineering and science. Alex Gray, Formative Content for World Economic Forum.